1. Laminate the penguins, clue cards, and the answer key. 2. Cut out the penguins and put them in a baggie. 3. Stick the baggie and clue cards in a file folder. 4. Attach a baggie to the back of the folder for the answer key. The goal is for the students to put the correct penguin on each clue card. 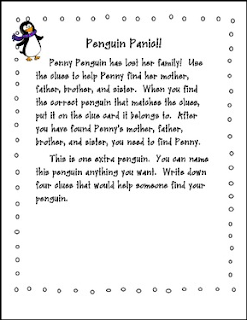 To differentiate, I included an extra penguin and blank cue cards for the students to make up their own clues. They can name the penguin (ex. Pearl Penguin) and then give clues as to which penguin is theirs. As always, we hope you love these printables! Thank you so much for your business and we hope you visit us again! If you enjoy this freebie, please let us know by leaving your feedback! Thank you!